Delivering heavy rock and classic heavy metal since 1993, Italy's Essenza returns with their third full-length album Devil's Breath. Honestly, I took me a few songs and more than one spin to appreciate this work. But eventually Devil's Breath grew on me. The genuine undercurrent here is traditional heavy metal circa the 1980's. Imagine a mixture of Iron Maiden and Anvil with a little Metallica for extra speed and heaviness and some Judas Priest for accessibility. Essenza's strength comes from fine bass work emphasizing the steady rhythm section, versatile and creative fret work in the solos, and quite diverse arrangements. The last push the songs beyond the ordinary and mundane one could expect in less skilled hands. Deep Into Your Eyes, Universe In a Box, and Edge of Collapsed Word move with an entertaining and uncommon ingenuity for classic heavy metal. Most any fan of the glory days can resurrect the past thrills, but Essenza, on Devil's Breath resurrects, invigorates and reinterprets them with a fresh sensibility. I like it, and can easily recommend it. 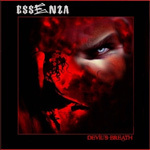 Most any fan of the glory days can resurrect the past thrills, but Essenza, on Devil's Breath resurrects, invigorates and reinterprets them with a fresh sensibility.